Mobile voice calling, despite increased competition and the threat of new disruptive technologies, remains the most important revenue generator for the incumbent mobile network operators worldwide. However, network operator voice revenues face immense pressure and will continue to be eroded by competitors with lower-cost or free (ad-supported) service offerings. Mobile data traffic, though rising impressively in volume, is failing to make up the shortfall in revenues, potentially leading to a scenario where overall revenues remain in decline for mobile service providers. This, in a nutshell, describes the backdrop to today's mobile voice communications industry from the incumbent's perspective. Meanwhile, users of mobile video calling services -- such as Skype -- are forecast to increase to over 130 million users by 2018, according to the latest global market study by Juniper Research. However, questions remain over the upside potential for mobile video calling to generate significant revenues for service providers. The Juniper market study findings observed that as with many over the top (OTT) services, only a small proportion of mobile video calling users pay for the service directly. OTT mobile video calling players are therefore widening their service offering and opening their client bases to third parties or developing their own apps in a bid to increase monetization options. "The role of mobile video calling is becoming clearer," said Anthony Cox, associate analyst at Juniper Research. With a number of OTT players having gained a critical mass of users through the provision of free video services, those players are now introducing an array of premium products or creating revenue-share partnerships to create a viable revenue stream. The study also found that new standards such as WebRTC (Real Time Communication) will improve integration of mobile Voice over IP (mVoIP) functionality into web sites and mobile apps, paving the way for the development of new services such as direct access to sales call centers from websites. With the arrival of 4G technologies, most mobile network operators will adopt VoLTE, increasing their network efficiency, though direct revenues will be limited. Specialists such as Kineto and Amdocs have found a niche in creating OTT monetization strategies for multinational mobile network operators. 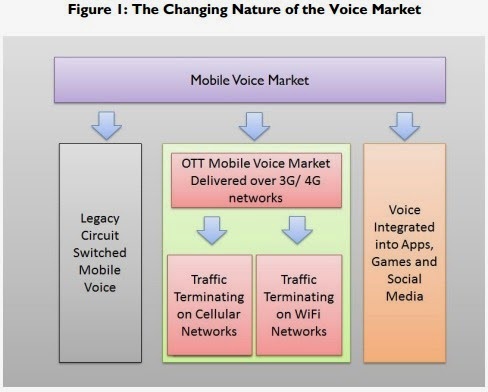 Mobile network operators and rival OTT carriers are collaborating on creating advanced carrier OTT voice services, potentially representing the most important change in the voice market since the advent of VoIP.